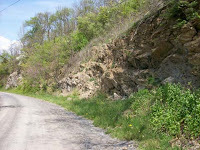 I traveled the back roads of Augusta County today on another glorious spring day with temps in the low 80s. After visiting with friends I decided to meander through the western part of the county with the windows down and the wind blowing across my face ... it was almost Heaven. 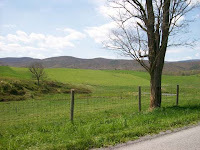 The fields are very lush and green at this time of year, and the leaves are "greening up" on the mountains as the trees leaf out from the base of the hills upward. I couldn't get enough of how beautiful everything was. Lance Cpl. Nate Salatin, United States Marine Corps, is back from Iraq! 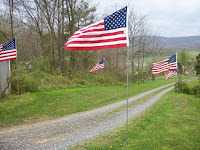 He arrived home over the weekend to American flags lining the driveway in rural Augusta County, a reminder of our thanks for his service to our country. The lush green of the hillsides and mountains must certainly be a sharp contrast to the dull tan-colored sands of Iraq. As the flags were put in place, Nate's beloved cat, Moofie, joined us to watch ... this elusive cat that won't let anyone but Nate near her ... but it was almost as if she sensed he was coming home. She even jumped up in the back of my van to check out the flags waiting to be put up. Nate attended his freshman year at Virginia Military Institute and then his Marine Reserve Unit was activated in June 2006 to go to Iraq. His plans are to return to VMI in the fall to continue school. Welcome home, my friend. You were missed and we're glad God kept you safe in his hands during your time at war. Thank you for your service ... your part ... in keeping us safe from terrorism. Background posts about Nate are here, here, here, here, here, here, here, and here. In his post "Republican" State Senators Experiencing Serious Foot-in-Mouth Disease, Jim compares Sen. Emmett Hanger's recent comments insinuating "the people" are inconsequential when it comes to matters of state business and Sen. Walter Stosch's comment that the 2004 tax increase was not "$1.4 billion." Denial, not in touch with the people ... it sounds as if it's time for a change in the 12th District as well as the 24th District. It's time for a change on June 12. Scott at Scott's Morning Brew has picked up on the Hanger controversy with Hanger Kicks Off Campaign, Goes On Offensive (by being offensive). Nate's coming home this weekend! This weekend is when Lance Cpl. Nate Salatin will be returning home after the better part of a year in Iraq. His Marine Unit will arrive at the Lynchburg Armory where family and friends will greet them ... and then home to Augusta County where American flags, signs of welcome, and yellow ribbons will line the driveway. The homecoming plans are under way. But I am seething about this (I can't IMAGINE how you feel) and as I was doing my mundane work of making PB&J for my six little future Republicans of America it occurred to me how absolutely irrelevant and disposable I must be, just a common citizen, even more invisible and insignificant than you tireless workers. So much for a republican form of government when the people who are supposedly being represented aren't 'important enough' to count!!" Elle at In-Politically Correct has posted Hanger's 1st order of business -- go on the attack where she talks about the way he slammed the very volunteers who helped put him in office. Senator Hanger has already set the tone for his campaign. He is negative and insulting. He mocks the people who work so hard to promote Republican principles. And, he has broken Reagan's 11th Commandment. I just wanted to thank you for sending this email. Those are UNBELIEVABLY ungrateful and back-stabbing statements that Hanger has made and I would have had no idea if not for this list. ... there is NO EXCUSE for these words that have been slung like razors at the very people who do the thousands of mundane tasks, often invisibly, to elect the likes of him. Not to mention alienating those of us who ride on your overworked and underpaid coattails but who believe in the cause of liberty, too, and vote accordingly. I, for one, want to thank you (and all the others)--although that's not much thanks I hope it goes a little way toward knowing that what you do is both noticed and appreciated. "Thank you for your service, thank you for your dedication, thank you for your commitment to America. Thank you ... for keeping us free." Mark your calendar -- FRIDAY, May 4, at 10:00 a.m. Come see them off and wish them well! LTE: "Hanger a Democrat Playing Republican"
Wednesday's edition of The News Leader published an article regarding the primary challenge by Scott Sayre to incumbent state Sen. Emmett Hanger. Among other things, the article suggested that this challenge would tear apart the local Republican party opening the door for a Democrat to take the seat. Mr. Hanger also suggested that his vote for a huge tax increase in 2004 would help prevent an increase in property taxes. Have you seen your new property tax assessment? How did this work out for you? Members of my family and friends worked very hard to unseat Frank Nolen and elect Emmett Hanger in 1995. The centerpiece of this effort was Mr. Nolen's refusal to go along with then-Gov. Allen's tax cut. Now we have Mr. Hanger betraying the people who supported him by crossing over and voting for the huge tax increase in 2004 virtually weeks after he had been re-elected using ads assuring us that he would not vote to raise taxes. We don't need Republicans who vote like Democrats. Hanger pulled the same bait-and-switch in 1999. Fool me once, shame on you. Fool me twice, shame on me. I will be supporting and voting for Scott Sayre in the June Republican state senatorial primary. I urge others to do the same. to safeguard our tax money in Richmond! Firstly, I want to assure all of you that I am safe and uninjured. Although I was in close proximity to the massacre, thanks to God's protection, I walked away unscathed. I greatly appreciate your prayers and concern for my well being. ... I have recounted my experience on the day of Apri 16, 2007. My day started early. Eight o'clock found me walking through a swirling snow shower to my first class. This semester Mondays are my heaviest class days. I have classes from 8:00 through 11:00 and then another class later in the day. At the time of the second shooting rampage I was in the middle of my second class located on the first floor of Randolph Hall. Around 9:40 a.m., with only a few minutes of lecture remaining, a breathless classmate burst into the classroom. Hurriedly, he announced that he had heard a rumor that "there was a gunman on campus." According to his story, there had been several people killed in an incident at AJ (Ambler-Johnson residence hall). Naturally, this caused a storm of confusion. Several students, including myself, thought that the latecomer's jumbled story was some sort of joke or an excuse for oversleeping. He had hardly finished speaking, however, when a police quad rushed in to secure the building. A heavily armed officer entered our classroom and informed us that there was a gunman (or possibly more than one) in the area. He told us to remain in the classroom, barricade the doors, and stay away from windows. With that, he left as abruptly as he came and continued down the hall. By this point, I knew that something very serious was occurring. However, the authorities did not give us any additional information beyond the fact that "there might be a shooter in the area." No one knew exactly what to believe. Several students near me began calling friends via cell phone in an attempt to find out what was going on. By 10:00 a.m. many different conflicting stories were flying around. One fact was clear, however: there was a shooting in Norris Hall and multiple gunmen might be at large. Around 10:30 a girl in our class was able to tune into the police and local media websites via her laptop wireless connection. We all gathered around her and listened to the incoming reports. Many of us were surprised to find out that there was a shooting earlier in the day. (As it turned out, students were notified by email around 9:30 a.m.) Our professor was just as clueless as we were. Around 11:30 the police told us that the gunman was down. The tension of the situation lessened somewhat following the announcement. Students were permitted to venture out of the classroom. However, the building was still sealed and police strongly encouraged everyone to remain in secured classrooms. At noon, university authorities conducted a press conference with reporters. It was only then that my clasmates, professor, and I learned the severity of the tragedy. Initially we had been told that there were one or two fatilities and eight people were injured. As the latest reports were made available via internet broadcast we were stunned. No one imagined that the death toll would be so great. Finally, sometime after 1:00 the occupants of our building which included staff, professors, and other engineering classes were cleared to evacuate. Police directed us to exit through a basement level entrance in the rear of the building. I later learned that Randolph was the last building to be evacuated because it was so close to Norris. At last, I made my way back to my dorm skirting the perimeter of campus. The Code of Virginia section §§18.2-83: Any person who makes any threat to bomb any place of assembly while knowing the claim to be false shall be guilty of a Class 5 felony. If that person is under fifteen years of age, he shall be guilty of a Class 1 misdemeanor. It has been learned that the gunman involved in last week's VA Tech tragedy tested the university's official reaction to danger by making bomb threats in the days leading up to the horrific massacre on April 16. In the wake of that rampage, a slew of bomb threats have been received by schools all across the country including right here in the Shenandoah Valley. Delegate Chris Saxman has been paying attention. With four children in school, he is aware of the bomb threats called into many local schools causing young students to be emotionally traumatized and wasting the resources of our law enforcement officers. In most bomb scare cases, however, judges give a slap on the wrist to the offenders and let them go. Delegate Saxman proposes putting teeth into existing bomb threat laws with legislation to include mandatory minimum sentences. There would be no more slaps on the wrist for someone who takes existing laws lightly. Sounds like a good proposal to me. Read Delegate Saxman's press release below and make up your own mind. Staunton – Delegate Chris Saxman (R-Staunton) announced today that he wants to strengthen the Commonwealth’s penalties on making false bomb threats. He is considering legislation to be proposed in the 2008 session of the General Assembly which convenes in January. In the past week, several false bomb threats have been called in to local area schools. In lieu of the recent bomb scares, Delegate Chris Saxman believes that Virginia needs to strengthen its laws on false bomb threat claims so parents feel safe sending their children to school and precious resources are not drained from our law enforcement community. The Code of Virginia section §§18.2-83 states that any person who makes any threat to bomb any place of assembly while knowing the claim to be false shall be guilty of a Class 5 felony. If that person is under fifteen years of age, he shall be guilty of a Class 1 misdemeanor. Delegate Saxman will consider submitting legislation that will include mandatory minimum penalties for calling in false bomb threats for any person that commits such an act. Wow. Here's an interview with some common sense spoken by a Hollywood actor ... one with strong convictions about our role in Iraq. Radar.com interviewed actor Jon Voight shortly after a visit to Walter Reed Hospital to visit with U.S. troops wounded in Iraq. He supports President Bush and Vice President Cheney, he supports the war in Iraq, and he believes this is a religious war that affects the entire globe. This war is not Vietnam, he told Radar.com. "While you might not hear people say, 'I don't support the troops,' the country and the media on the whole are increasingly caustic and critical of the president and Iraq. ... It's sad for me. The attack on George Bush I find to be reprehensible. From the beginning it was politically motivated, and it's been very successful, the disrespect for our president and for our country and for our government. I have a great regard for our government. We have all sorts of checks and balances that are afforded to us by our constitution. We have a lot of wonderful hardworking people in the government. Once it gets to be partisan, it takes the energy in another direction." " ... the increase in troops that has been recommended by the president, [the wounded troops] say anybody who's over there knows the value of backup and we should be behind this. When you're out in that situation in danger, you want to know you've got backup. Only one guy said he wasn't going back to Iraq, and he had been wounded a couple times. But all the other guys wanted to go back. One young woman, a very attractive young woman, had her leg amputated. But she says she's going to find a way to get back into it. She just reupped and she said they would find something for her to do." "We know that Hezbollah is here; we know there are cells from different terrorist organizations that are here and operational and that there are others waiting too. So listen, it's a serious business. It's wartime, guys. Because we don't have a continuous attack on our shores, we can get complacent. We've got to all be alert now, we've got to be a part of it and be supportive of our troops for sure." "It all gets distorted. Rumsfeld was maligned and villainized; he's a hardworking guy, doing the best he can. He's got such a huge responsibility, and if he makes the slightest error, people's lives are at stake. So, you don't think he carries a big weight? He does. Now they've gotten rid of Rumsfeld. Well okay, maybe he didn't have the answer, maybe there was a fresh answer required. But you've got to respect the guys who are out there, working hard as public servants. These guys are good guys. People don't like the war because we don't seem to be winning it. And these people think that if we just walk away everything will be fine, but that's not the case. " The Right-Wing Liberal has affectionately called From On High's post "We've Done Nothing All Right" the "Fuhrman Manifesto." In it Jerry tells of the 10,000 gun laws that are on the books to keep us safe and, yet, whenever a deranged act occurs such as the Virginia Tech massacre the liberals scream for tighter and more gun laws. Nothing? We now have 10,000 gun laws in this country. That's nothing? Every time another notorious killing takes place, these guys drag out that same old, worn-out, failed argument. We've done nothing. We need to do something. We need a gun law. We've sat back and allowed these depraved fools to convince us that we've done nothing - over and over again - about crime in this country and now, 10,000 laws later, the murders continue - and we are still accused of doing nothing. Read his response. It is excellent. Thanks, Jerry, for the common sense. Check out Jamie Radke's post about Sen. Emmett Hanger's finances. VA Tech ... a moment of silence - did you feel it? At 12:00 Noon today the radio went silent. All was quiet around me as the nation paused to remember, mourn, and pray for the victims of Monday's massacre at Virginia Tech. We are ... VIRGINIA TECH!!! Today ... here at home, around the country, and around the world ... we are all Hokies. In memory of the 32 students and faculty killed in Monday's senseless tragedy at Virginia Tech, many will wear the school colors of maroon and orange. A moment of silence will be observed at 12:00 Noon Eastern Daylight Time. Ross Abdallah Alameddine, 20, Saugus, MA. Christopher "Jamie" Bishop, 35, Blacksburg, VA.
Brian Roy Bluhm, 25, Cedar Rapids, Iowa. Ryan Clark, 22, Marinez, Georgia. Austin Cloyd, 18, Blacksburg, VA.
Daniel Perez Cueva, 21, Lima, Peru. Kevin P. Granata, 46, Blacksburg, VA.
Matthew G. Gwaltney, 24, Chester, VA.
Caitlin Hammaren, 19, Westtown, NY. Jeremy Herbstritt, 27, Bellefonte, PA.
Rachael Elizabeth Hill, 18, Glen Allen, VA.
Emily Jane Hilscher, 19, Woodville, VA.
Jarrett Lane, 22, Narrows, VA.
Matthew J. La Porte, 20, Dumont, NJ. Henh "Henry" Lee, 20, Roanoke, VA.
Liviu Librescu, 76, Blacksburg, VA.
G. V. Loganathan, 51, Blacksburg, VA.
Lauren McCain, 20, Hampton, VA.
Daniel O'Neil, 22, Lincoln, RI. Juan Ramon Ortiz Ortiz, 26, Puerto Rico. Erin Peterson, 18, Centreville, VA.
Michael Pohle, 23, Raritan Township, NJ. Julia Pryde, 23, Middletown, NJ. Mary Karen Read, 19, Annandale, VA.
Reema Samaha, 18, Centreville, VA.
Waleed Mohamed Shaalan, 32, Egypt. Leslie Sherman, 20, Springfield, VA.
Maxine Turner, 22, Vienna, VA.
Nicole White, 20, Carrollton, VA.
Democrat Harry Reid, be a man and tell the military to their faces "this war is lost"
As reported by Virginia Virtucon, democrat Senator Harry Reid proclaimed, “this war is lost.” Be a man, Harry Reid. Go to Iraq, walk up to one of those soldiers or Marines face-to-face, and tell them this war is lost. My kids, including John Maxfield (I clump him in with "my kids" these days), will be attending a candle light memorial service tonight at Blue Ridge Community College located here in the Valley. The 9 pm service will honor and remember the victims of Monday's senseless tragedy at Virginia Tech when students and instructors were gunned down by a deranged student. Similar memorials are being held around the state at universities, colleges, and churches. The home schooling community has been touched by the senseless tragedy Monday at Virginia Tech. Lauren McCain, 20, of Hampton, was friends with one of our SWAC area home schoolers and often babysat for the children of one of their professors. She was an undergraduate majoring in international studies and she, too, had been educated at home. On her MySpace page, Lauren listed “the love of my life” as Jesus Christ. Her family said she became a Christian some time ago. “Her life since that time has been filled with His love that continued to overflow to touch everyone who knew her,” the family said in a statement. Her uncle Jeff Elliott told The Oklahoman newspaper that she was an avid reader, was learning German and had almost mastered Latin. She ... had worked at a department store for about a year to save money for college. She spent several years of her childhood in Oklahoma, but her father’s Navy career also took the family to Florida, Texas, and then to Virginia. "Lauren had such a sweet innocent heart," Jeanne Meadows, who attended church with her, wrote to MSNBC.com. "I can bet you at the last moment of her life she was most likely praying for the gunman and forgiving him." Our thoughts and prayers are with Lauren's family. Two home school friends who had graduated in the same year were in danger ... two young men who had grown up with my kids, spent hours at my house, whose families are part of my family. I had addressed their small home school class at their commencement ceremony ... I knew them well. One, Nate, a Lance Corporal in the Marine Corps, was returning home from Iraq on Monday, winging his way to Europe and then on to California. We were grateful for his safety after spending months in the mine fields of Iraq. The other, Ryan, a junior at Virginia Tech, in the mountains of Virginia only two hours from home and supposedly out of danger, but suddenly caught up in the middle of a horrific act by a deranged fellow student. Last night I received emails from both families with news of each son. As I read them I couldn't help but think again of the irony of it all, the angst that was felt by the local home school community on Monday wondering in the hours after the shooting rampage if Ryan was safe ... and at the same time praying for Nate's safe journey back to the States. How many times over the years have we had violent incidences that were caused by "a loner"? Virginia Tech's massacre on Monday was yet another. 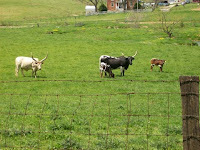 I've often laughed and said I'm a "pack animal" -- that is, I travel in herds. Not that I don't like to have my down time away from the hustle and bustle but, for the most part, I enjoy the interaction of friends and colleagues. I like to have people around me. Perhaps by hashing out ideas, venting frustration, and being collectively creative it prevents the build-up of anger that happens to "loners" who have no one to talk with ... who have no friends to listen to them or advise them ... and, therefore, they plot and plan and build up perceived injustices ... and then explode into violence. Riley at Virginia Virtucon has information about the VA Tech gunman's suicide note with this post. It's his opinion, thoughts about the reasons behind the shooting. Some are overreacting to it which only results in shutting down the discussion. -- DJ at Right-Wing Liberal has weighed in here, and has an excellent background piece about the Biblical history of the "Ismail Ax" name inscribed in red ink on gunman Cho's arm here. -- Greg at Black Velvet Bruce Li weighs in here. -- Grumpy's Gripes weighs in here. -- Ward adds his thoughts here.-- Leslie Carbone has her thoughts here. Thank you all very much and good afternoon. What a pleasure it is to be back at the Shad Planking, Virginia’s annual political rite of spring. I want to thank the Wakefield Ruritan’s Club for inviting me to be here today and giving me a chance to serve as the keynote speaker for this year’s event. I’ve enjoyed attending this event for many years, but you honor me greatly today by giving me a chance to stand atop this old flatbed trailer and give the keynote address. And I want to thank the Ruritans, here in Wakefield and hundreds of other places all across Virginia, for the hard work you do every day to reach out and serve your community. You do good work, and that sense of community spirit is one of the things that make Virginia a very special place. I want to thank my good friend and colleague Fred Quayle for being here today to introduce me. I have served with Fred Quayle in state government for the past 12 years, and I can tell you that he does a great job representing the people of the 13th district in the State Senate. Now my friends, I know that this is supposed to be a light hearted event and the keynote speaker generally takes his time to poke fun at our state’s politicos and fire up the crowd for the fall campaigns. I assure you that I had a number of very good zingers all lined up for you today, but quite frankly, in light of the events of the past few days, this is not a time for light heartedness and poking fun. So, I want to spend my time this afternoon speaking to you from the bottom of my heart about a much more serious situation. Needless to say, this is a difficult time for our Commonwealth. On Monday of this week a young man who obviously had many deep and dark problems went on a shooting spree on the campus of Virginia Tech and killed 32 innocent people. I have served in the public life of this Commonwealth for the past 16 years, and I can honestly tell you that the past two days have been the most difficult days of that service. We’ve heard of tragedies of this nature before, in other places, but we never thought they could strike here, not in the Commonwealth of Virginia, and certainly not on the peaceful, safe, rural campus of a great University like Virginia Tech. But the truth is that events of this nature can occur anywhere at anytime, and the shootings on the Virginia Tech campus vividly remind us that we not immune from these events. Virginia Tech is one of our nation’s finest institutions of higher education. The students, faculty, staff and alumni of Virginia Tech are a close family, and as the father of a 2006 graduate of Virginia Tech, I consider myself a part of that family as well. In difficult times families pull together, and I have no doubt that the Virginia Tech family will pull together as well in this difficult time. Likewise, the people of Virginia are a resilient people, and I have no doubt that we will pull together in this difficult time, but the truth is that there is a big hole in the heart of Virginia today. It is said that tragedies and the difficult times of life make us stronger, and I believe that’s true. By relying on our faith, our families and friends, I am confident that we will endue these present troubles, and emerge from this tragedy stronger that ever. Yesterday I had the honor of traveling to Blacksburg to attend a Memorial Service with President Bush and Governor Kaine. It was a wonderful event, and it showed the persistent Hokie pride and spirit like it has never been showed before. I was proud to there, and I was proud to be a Hokie. While there I had a chance to meet with some of the families who lost loved ones in Monday’s shooting, and their stories are just beginning to emerge. And I can tell you that the magnitude of this event does not sink in until you look into eyes of moms and dads, brothers and sisters, husbands and wives, who have lost loved ones. We’ve learned the story of Liviu Librescu, a 76 year old internationally respected aeronautical engineer. Mr. Librescu was a survivor of the Holocaust, and was gunned down while he tried to barricade a door to save his students. We’ve learned the story of Ryan Clark, a 22 year old Resident Assistant, who we believe was killed when he responded to the first shooting in the Ambler Johnston Residence Hall, trying to assist another student who was also killed. These victims, and 29 others, did nothing to deserve their fate, and there is nothing or no one who was responsible for the fate other than the evil that entered the heart of the one who committed this senseless act. Today, as we gather together in this field we must remember them, for that is the thing that matters most. In the face of a tragedy of this nature it is natural for us to look for an explanation for why things like this happen, but there is no explanation that will suffice. Time will tell what prompted someone to commit these senseless acts, and there are a number of questions that have been raised about what, if anything could have been done to prevent these acts or reduce their magnitude. These are legitimate questions and I assure you that we will find answers to these questions when the investigation has been completed, but this is not the time for questions – this is a time for hurting and crying and mourning and supporting those who need our help. In his Word God does not tell us that we will be immune from difficulties of this nature, but he does promise that He will enable us to endure them and overcome them if we rely on Him. I have been reminded of this many times in these past three days. I have been reminded of those words many times in these past three days. Yes, this is a time of hurting, pain, crying and mourning – and there is a hold in our world today - but if we do our work right, it can also be a time of coming together and of strength. Now I want to ask you all to help me with something. I’d like to ask that you turn to the person next to you and ask that they quiet themselves for a moment of silence in honor and memory of those who lost their lives at Virginia Tech on Monday. My friends we are all Virginians, and today we are all Hokies! I was supposed to attend the Shad Planking in Wakefield today with Spank That Donkey and Johnathan Maxfield ... but stayed home because I was sick. Just talked with them on the phone as they were driving back and heard about their experiences. They met up with Alton (I'm Not Emeril); saw Whitney Duff of Americans For Prosperity (AFP) and Delegate Chris Saxman from the 20th House District in the Valley. Spanky said Bill Bolling gave a great speech and concluded it with a remembrance of the victims of the Virginia Tech massacre by proclaiming everyone Virginians ... and then proclaiming everyone Hokies. His oldest son, Matt, graduated from VA Tech last May so they are part of the Hokie family. DJ at Right-Wing Liberal has weighed in here. Greg at Black Velvet Bruce Li weighs in here. Grumpy's Gripes weighs in here. Virginia Tech family members across the country have united to declare this Friday, April 20th, an "Orange and Maroon Effect" day to honor those killed in the tragic events on campus Monday, and to show support for Virginia Tech students, faculty, administrators, staff, alumni, and friends. "Orange and Maroon Effect" was born several years ago as an invitation to Tech fans to wear orange and maroon to Virginia Tech athletic events. We invite everyone from all over the country to be a part of the Virginia Tech family this Friday, to wear orange and maroon to support the families of those who were lost, and to support the school and community we all love so much. Virginia Tech President Charles Steger, who has come under attack since the senseless shootings, received applause and a standing ovation of support from students and families attending the memorial service. Addressing a sea of Hokie burgandy and orange, Dr. Steger said sentiments of support and grief have poured in from all around the world and touched their hearts. He especially thanked the Virginia Tech, Blackburg, and Virginia State police as well as all the emergency responders who rushed to their campus to assist in the emergency. Those in attendance include United States President George W. Bush and Mrs. Bush, Governor Tim Kaine, Lt. Governor Bill Bolling, Attorney General Bob McDonnell, senators, congressmen, and others in leadership in the Commonwealth of Virginia. Standing ovation and applause for President Bush.... "Laura and I have come to Blacksburg today with hearts full of sorrow. ... It is a day of sadness for our entire nation. ... At this time of anguish I hope you know that people from all over the country are thinking of you...."
A candlelight vigil will be held tonight. VA Tech tragedy: "I will lift up mine eyes unto the hills...."
Cho Seung-Hui, a 23-year-old resident alien from South Korea, has been identified as the gunman responsible for Virginia Tech's shooting rampage. He was a senior English major living on campus at Tech with a home town listing of Centreville, VA.
Reports coming from other students are he was a loner. How many times have we heard that about someone who was a loner who snapped and caused tragedy in the past? More info at SWAC Girl. “As parents of a college student in Virginia, Susan and I ache for the heart-broken families and friends who have lost loved ones today at Virginia Tech due to this heinous, despicable mayhem. Our prayers are with them. Their sons, daughters, brothers and sisters were learning and improving their young lives on the vibrant, close knit and beautiful campus. “All of America is in grief for the families whose lives and dreams were shattered. “As many of us know, Virginia Tech is not just a school, it is close and caring community. The students, alumni and loyal supporters will be drawn together in mourning but also praying for the recovery of their classmates who suffered terrible injuries but have survived. VA Tech classes are cancelled the remainder of this week. Norris Hall is closed through the end of the semester. Notice: The Collegiate Times main server is down. CollegeMedia.com is the website of the parent company. Check for latest news here. "Something takes over your body to survive...."
The gunman entered the classroom of about 17 students and shot the professor first, then turned the gun on students sitting on the front row. Derek said 5-10 students were critically injured and he believes some of those on the front row are among the dead. Derek was shot in the arm and dove under his desk to find protection ... and as students fell to the floor after being shot the gunman continued to shoot them. And that's when Derek and others jumped up and barricaded the door. They pushed everything they could find against the door, then put themselves against it ("shoes and hands and feet," he said) to prevent the gunman from reentering even as he shot at the door. Derek said he most remembers the face of the gunman, calm during his heinous act, and the blood-covered faces of his fellow students. A sense of survival automatically takes over in such a situation, he said ... an instinct even while experiencing a sense of disbelief at the scene that seems like something out of the news or a movie. He said the need for survival takes over your body ... these are all split-second decisions made by a young man mature beyond his years and now, sadly, he has become a part of history in what is now known as the deadliest shooting rampage ever in the U.S.
Derek, from Roanoke, said his parents were on their way to campus today. He is in a state of shock as the reality of the event hasn't completely settled over him. He placed no blame on school administrators, saying it was almost impossible to prevent a tragedy like that. Our prayers are with Derek and his family, and the families of the victims who will be identified as the day unfolds. Virginia Tech ... pray for them. "Today, our nation grieves with those who have lost loved ones at Virginia Tech. We hold the victims in our hearts, we lift them up in our prayers, and we ask a loving God to comfort those who are suffering today." Today is a sad day in the Commonwealth of Virginia. A dark cloud hangs over us as the names of the victims from yesterday's shooting carnage are coming out ... names of students and faculty members. Stories of herorism are coming out as well ... professors protecting students ... students protecting each other. This tale has just begun. Every corner of Virginia is touched by the horror because someone knows someone who knows someone. Virginia Tech's campus is two hours south of Staunton so many students are from the SWAC area. Word is still trickling in from students but Johnathan Maxfield, a first-year college student, has stories of personal contacts with his friends who attend Tech. Shepherd Smith of Fox News reported he had never seen anything like this before ... literally hundreds and hundreds and hundreds of news satellite trucks on the Tech campus. President and Mrs. Bush will be arriving on campus later today. A memorial service is to be held this afternoon with the governor, lieutenant governor, and attorney general of Virginia attending. I've got to say that as my two college-age children left for school this morning I felt a moment's hesitation ... something I've not felt before. Yes, the campuses are huge and spread out and, in this post-9/11 world we're always aware that a terrorism event could occur. But the gunman at Virginia Tech was a student, it has now been discovered, which makes it even more chilling to me. He was among those students, those professors ... and yet in a cold-hearted way he was able to gun down and take the lives of dozens before turning the gun on himself. If you've never been to Tech's campus you've missed one of the most beautiful schools in the country ... literally hundreds of acres of green lawns, school buildings, and dorms. Many buildings are stone ... my step-dad was a cadet there in the 1940s in one of the older stone buildings. 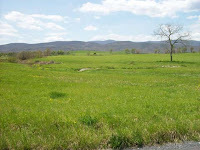 Blacksburg is located on a high mountain plain ... they have snow when it's not occurring in other parts of the state. The mountains surround it ... beautiful Mountain Lake is not too far away. Radford University where one of my sisters graduated is down the road. Chris at Spank That Donkey has a comparison between the Tech tragedy and the shooting at Appalachian Law School in Grundy several years ago. Good piece. Attorney General Bob McDonnell issued the following statement regarding the fatal shootings today at Virginia Tech. “My prayers are with the families and friends of those killed in today’s tragic shootings at Virginia Tech. We pray for all those injured, that they will recover from their injuries. I urge my fellow Virginians to pray for all those impacted by this heartbreaking occurrence. Note: The Attorney General’s public schedule for the rest of today, Tuesday April 17th and Wednesday April 18th is cancelled. *The Attorney General will attend the memorial event in Blacksburg at noon tomorrow. Lieutenant Governor Bill Bolling today released the following statement on the shooting tragedy at Virginia Tech. “Our deepest and most sincere condolences go out to the family and friends of all those who have lost loved ones this day in the senseless and inexplicable tragedy that has occurred on the campus of Virginia Tech. They are in our constant thoughts and prayers. “In addition, our prayers and best wishes go out to all those who were wounded for a full and speedy recovery. “We have been in constant contact this morning with Governor Kaine’s office. They have kept us fully informed of the events at Virginia Tech as they have occurred. “In addition, I have personally spoken with Dr. Charles Steger, the President of Virginia Tech, and I have expressed to him our willingness to assist the university in this difficult time in whatever way we can. We will stand ready to do so in the days and weeks to come as well. “Virginia Tech is one of our nation’s finest institutions of higher education. The students, faculty, staff and alumni of Virginia Tech are a close family. As the father of a 2005 graduate of Virginia Tech, I consider myself a part of this family as well. In difficult times like these families pull together, and I have no doubt that the Virginia Tech family will pull together as well in this difficult time. “In the face of a tragedy of this nature, it is natural for us to look for an explanation for why things like this happen, but there is no explanation that will suffice. Time will tell what prompted someone to commit these senseless acts, but now is a time for mourning and supporting those who need our help. Our nation is shocked and saddened by the news of the shootings at Virginia Tech today. The exact total has not yet been confirmed, but it appears that more than 30 people were killed and many more were wounded. I've spoken with Governor Tim Kaine and Virginia Tech President Charles Steger. I told them that Laura and I and many across our nation are praying for the victims and their families and all the members of the university community who have been devastated by this terrible tragedy. I told them that my administration would do everything possible to assist with the investigation, and that I pledged that we would stand ready to help local law enforcement and the local community in any way we can during this time of sorrow. Schools should be places of safety and sanctuary and learning. When that sanctuary is violated, the impact is felt in every American classroom and every American community. Today, our nation grieves with those who have lost loved ones at Virginia Tech. We hold the victims in our hearts, we lift them up in our prayers, and we ask a loving God to comfort those who are suffering today. Virginians and the nation mourn as the story unfolds about the deadly massacre on Virginia Tech's campus this morning. Many stories are coming out from surviving students and will be told in the news and blogs in the days to come. We were thankful to finally hear that our fellow home school friends' son Ryan was safe as well as others who are friends of my college-aged children. We're in shock now as the reality of the situation tries to settle down on us ... parents calling parents ... friends calling friends ... as we try to confirm the safety of those we know. The relief is immense as yet another name is passed along of yet another student who is safe. Survivors have horror stories of students around them being gunned down ... stories of heroism are coming out ... stories of escape. The sad distinction is that Virginia Tech, my step-dad's alma mater, will now be known as the site of the worst shooting in U.S. history. With three weeks of school left, it remains to be seen if classes will finish out. At this time plans by Tech officials call for classses to resume tomorrow ... but that may change. Our prayers are with the families of those who were slain and with all of those at Virginia Tech. May God bless them all. News reports coming in are sketchy about this morning's shooting on Virginia Tech's campus where 22 students are now reported dead. Fox News has this report that also says 28 have been injured and the gunman is dead ... it's developing. "Today the university was struck by a tragedy we consider of monumental proportions," Virginia Tech President Charles Steger said during a press conference shortly after noon. "I cannot begin to convey my own personal sense of loss over this senseless, incomprehensible, heinous act." Snowflakes in April ... what's that about global warming? Hope they bundle up today while protesting global warming. It's cold (temp in 40s) and wet out there -- brrr. There's a great article about the 116th Infantry Brigade of the Virginia National Guard based out of the Staunton Armory and their training for the upcoming Iraq deployment in today's Waynesboro News-Virginian written by Alicia Petska. These are our neighbors, friends, family members in the SWAC area. These are the men and women who sacrifice so we may go about our lives in freedom. As a full-time personnel manager for the Staunton-based 116th Infantry Brigade, Maj. Carter has already helped send six battalions to Iraq and Afghanistan over the last four years. But, the 18-year National Guard member has never been called himself - this will be his first overseas assignment. “It’s kind of hard sitting back, watching everyone else go, not being needed,” he reflected Saturday. His wife, he added, was supportive when his marching orders arrived. A former Guard member herself - the two met while serving in the 116th - she understood the call of duty all to well. “She’s just praying for our safe return,” said Carter. Among those training and preparing are husband-and-wife team Spcs. Christina and Landon Phillips who will be leaving their one- and two-year-old daughters behind with family members. It will be Landon's second deployment and Christina's first. They are examples of the many citizen soldiers who are willing to do their duty to preserve our freedoms and safety here on the homefront. Thank you, 116th, for your service and dedication and love of country. We salute you and will keep you in our prayers. He and his Marine buddies have left Iraq and are on their way back to the States where they will debrief after their stay in Iraq ... and then return to their base in Lynchburg around the end of April. Homecoming celebration? You bet! Plans are underway; the bigger, the better! 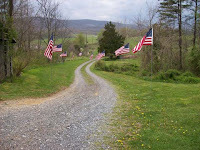 "Welcome Home" banners, signs of support for our military, American flags ... it will be good! April 15. Tax day. Day of dread. But bringing us hope in the Virginia General Assembly are our two guests tomorrow night on Bearing Drift Radio: Dels. John Cosgrove and Chris Saxman! Both Republicans have been strong advocates of holding the line on spending and reducing the tax-burden. Turn up your computer speakers and listen to their take on taxes and what we can do as Virginian's to hold government accountable. As always, the show is recorded live at 7 p.m. You are welcome to call in with your questions at (718) 664-9599. But since this is also "Virginia Politics On-Demand," you can listen to the archive program at your convenience a couple hours after recording, or by using our feed in your podcatcher. WHAT I AM ... is a voter tired of politicians who, everytime their voting records are subjected to public scrutiny, try to divert attention from their political and legislative failures by accusing their opponents of "attack ads" and "negative campaigning" ... and the news media who allow them to get away with it. WHAT I AM ... is a Catholic who loves his God and his Faith ... and who's been taught to respect all religions whose teachings are based in love, peace and charity. As such, I am embarrassed and ashamed of those individuals, in both private and public life, whose decisions and actions are devoid of any sense of character or morals; individuals who are only driven by what's best for them ... rather than what's right ... often times at the expense of many ... including our national security. WHAT I AM ... is a realist who understands that the terrorist attack that murdered hundreds of innocent Russian children could have occurred here, in our heartland. That's why I sincerely believe America needs now, more than ever, a President who sees with a clear and focused vision and who speaks with a voice when heard by both friend and foe alike, is understood, respected and believed. My fellow State Central Committee member James Atticus Bowden is supporting Tricia Stall in her challenge to Marty Williams in the 1st Senate District. Here is her announcement. Patricia Stall, a well known community leader, announced today that she will seek the Republican nomination for Virginia's 1st Senatorial District. Senator Martin Williams currently holds the seat and the nomination for the Republican Party will be decided by a primary that will be held on June 12th, 2007. Patricia "Tricia" Stall, mother of two, is happily married to her high school sweetheart, Dr. Mark Stall, for 31 years and they are members of Liberty Baptist in Hampton, Virginia. They reside in Newport News with their two children, Kelsey and Tyler. Mrs. Stall has served in various volunteer capacities in Newport News Public Schools and in her community for 18 years. Patricia 'Tricia' Stall is a past member of the Republican Party of Virginia's State Central Committee. She has served as a Court Appointed Special Advocate (CASA) volunteer in the Newport News Juvenile Courts and is a past member of the Newport News Bar Association's Judicial Screening Committee. Mrs. Stall served as the Newport News "kNOw Campaign" and "Ax the Tax" coordinator that defeated the Sales Tax Referendum November 5, 2002. She also helped establish and served as Executive Director of the Hampton Roads Taxpayer Coalition, an umbrella organization for all Taxpayer Alliances in Hampton Roads. Most recently, Mrs. Stall has joined the efforts of RETRO, Real Estate Tax Reduction Organization, to reduce the skyrocketing real estate tax rate burden on Newport News citizens. Mrs. Stall Pledges, "I will be a faithful Public Servant to the voters and taxpayers of the 1st Senate District of Virginia and protect them from unfair higher taxes and regional government run by unaccountable bureaucrats". Received an email today from our former SWAC area Military Mom who now lives in Northern Virginia. Her daughter, stationed with the Air Force in South Korea in 2003, was the one who saw the anti-war protesters' picture online in the local newspaper and asked what was going on in Staunton. Her daughter was one of the reasons we stood on the streets to show support for our troops ... and have continued to do so right up through the recent rally held on March 17. Imagine my surprise when I, "the Military Mom," received an invitation from the WHITE HOUSE to hear the President speak in the Rose Garden! Excited ... YOU BET! My daughter, Brandi, has proudly served this country in the USAF for almost 10 years now. It will be such an honor to meet her boss and the man I supported in both elections ... our great President George W. Bush. Congratulations, Military Mom ... and please tell President Bush how much we respect the job he has done keeping our country safe since 9/11. Not many men have had to shoulder that responsibility but he has shown outstanding leadership while enduring a constant stream of criticism from the Left. God bless you and Brandi, and God bless our country and our President. Have fun with W! Good grief ... time flies! It's already time for the annual Shad Planking and, from the sounds of it, a number of Virginia political bloggers will be in attendance. What about you? Will you be joining in the fun by planking your shad? It's great to have a new SWAC area blogger join our ranks. Yankee Philip will be adding his thoughts and concerns to the discussion so we look forward to having his input. Be sure to check out his blog on a regular basis. It was a great feeling to clear my rifle for the last time and finally take the combat sappy plates and side sappies (body armor) off of my flak jacket. ... It is starting to get pretty hot here, figures since we just moved into the stuffy holding tents. Nate's coming home. Keep praying for our armed forces. They're over there so the terrorists won't be over here, and they're doing a hell of a job. We are very appreciative of their dedication and sacrifice for our freedoms here at home. Thanks Nate ... thanks Salatin family. You are all our heroes. Semper Fi. Other posts about Nate: here, here, here, here, here, here, here, here, here. Has your Easter been nice? Were you able to attend church in peace today with no worry of bombs going off or homicide bombers invading the congregation? Did you enjoy a meal with family or friends ... did you hide eggs for the kids to hunt in your yard ... did you fellowship with friends and visit with family all in the safety and comfort of a country safe from terror? Thank a soldier ... thank a Marine ... thank their families. Say a prayer for them because their lives are in danger even as ours are safe. United Conservatives had the following as a reminder of what our military does ... for us. Your alarm sounds, and you hit the snooze button … again. After the last attack, he was on patrol for two days without sleep. He goes days—or weeks—without running water. You complain of a “headache”, and call out sick from work. He gets shot at, as others are hit, and keeps moving forward. You put on your anti-war shirt, and go shopping with friends. You make sure that your fake fingernails look just right. He clutches the Cross hanging on the chain next to his dog tags. You talk trash about your “buddies” that aren’t at the bar with you. He knows that he may never see some of his buddies again. He patrols the streets, searching for bombs and snipers. You complain about how hot it is in the mall parking lot. He wears heavy gear, not daring to remove his helmet to wipe his brow. He does not get to eat today, but was thankful for the one meal that he had yesterday. Your mom makes your bed and washes your clothes during Spring Break. He wears the same things for several days, but his weapons are clean. He doesn’t have time to brush his teeth today. You are upset because your class ran five minutes over. He just learned that his unit’s tour was extended by two months. You call your girlfriend, and set a date for that night. He waits for the mail, to see if there is a letter from home. He holds this week’s letter close and smells his love’s perfume. You roll your eyes as a baby cries in the restaurant. He gets a photo of his new child, and wonders if they’ll ever meet. He sees innocent people tortured and killed, and remembers why he’s fighting. You hear your classmates criticize the war. He hears the gunfire, the bombs, and the screams. You see only the failures that the news media want you to see. He sees the successes, even amidst the destruction all around him. You are asked to go to the store by your parents, and complain. He follows orders without hesitation, but longs to hear his father’s voice once more. You choose to stay home, watch TV, and snack on the couch. He is given one hour to eat, write home, pray, … and sleep. You crawl into your bed, fluff the pillows, and try to get comfortable. He crawls under a tank for shade and a 5-minute nap, only to be awakened by gun fire. You sit there and judge him, saying that he is a fool for doing what he does. If only there were more men like him, then fewer would need to do what he does. "Up from the grave He arose...."
You always proclaim to "support the troops" even when on the streets with anti-war signs or dressed as the Grim Reaper or holding the latest number of dead from the war in Iraq. Prove you "support the troops" ... watch this video. I dare you. Spank That Donkey has a post, Easter: Be Thankful To Those Who Sacrifice All, about the death this past week of SSgt. Marc Golczynski, 30, from Wheeler, TN. 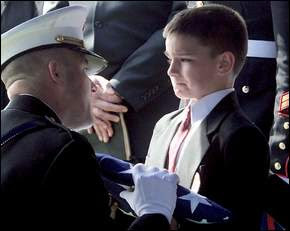 Pictured above is his eight-year-old son, Christian, accepting the flag that covered his father's casket. Thank you to Christian and his father for their sacrifice in keeping my family safe and free. May God bless them. Spent much of today at my cousins' church, Bethel Baptist, with my 11-year-old niece and my sister and mom. Bethel, located in Midlothian in Chesterfield County, is such an historic and beautiful old church ... started in 1799 with the building dedicated in 1817. It still houses a bustling congregation ... and currently an addition is being added that will double the size of the original sanctuary. Today the place was hopping with members, visitors, and youngsters. I'm a family-oriented person and love getting together with my siblings, cousins, and parents so today was something I thoroughly enjoyed. Bethel Baptist is located just behind Hallsborough Tavern which sits prominently on Midlothian Turnpike ... one of the old-time taverns used in the days when these were dirt roads and travel from Richmond to that point was a two- or three-day journey. Chesterfield County is very historic ... it is my birthplace and where I was raised ... and where most of my family still lives. Jerry at From On High has this interesting follow-up post, Oh Those Unintended Consequences, about the recent fallout at the Roanoke Times when they published the names of gun owners licensed to carry a concealed weapon ... and then backtracked. It seems, as Jerry says, they've done gun owners a favor because State Police have recognized the fact there is sensitive information in those records that should be kept private. Check it out here. Snow! ... in Midlothian ... on Easter weekend! Easter weekend ... drove over from the Valley to visit with my folks who live in the Richmond area ... and I woke this morning to find snow all over the place ... in the Richmond area ... on April 7! Yesterday after I arrived we walked around outside admiring everything blooming in my parents' yard. Today all those blooming things are covered in an inch or two of snow. Back in the Valley my son reported snow showers last night but it wasn't sticking when I talked with him at midnight. It's supposed to warm to the upper 40s later today so the snow won't last long. I've already taken photos to remember it in the event we go another 25-30 years before there's another white Easter in Richmond. It's Easter weekend ... Lance Cpl. Nate Salatin of Augusta County is nearing the end of his deployment to Iraq. On this holiest of Christian holidays my thoughts turn to him more often, praying for his safety ... wondering how he's spending his time while on patrol ... wondering about his thoughts on this Easter weekend so far from home. May God keep him safely in His hands. Semper Fi. Spank That Donkey has more on the unrest in France, a story he has been following since last year's riots. Check out France Sitting on a Powder Keg. A boating accident on Smith Mountain Lake has left one man dead and another missing. Two men, including well-known Harrisonburg entrepreneur and philanthropist Walter Curt, and Bridgewater resident Dennis Zimmerman, were rescued from the water, treated, and released. Richard Williams Smith was killed, and Grottoes resident David Reynolds, 44, has been missing since the accident occurred. He is a volunteer with the New Hope Fire Department ... and someone my husband has known the past several years from his job delivering freight to Walter Curt's home. Conditions on the lake Wednesday afternoon were reported to be windy with choppy waters. No official reason has been given for the accident but alcohol use and collision have been ruled out. Walter Curt is a friend to the Valley Family Forum and conservative candidates in the Valley. Our prayers go out to him and his wife, Martha, and to the families of David Reynolds and Richard Smith.
" ... that country [Syria] continues to be part of the Axis of Evil and a force that encourages terror in the entire Middle East." WHAT I AM ... is a movie go-er who is repulsed by those insecure, socially inept, elementary-thinking, ego-inflated "entertainers" who have appointed themselves "experts" in the fields of national security and geo-politics and then use their forum to attack this nation, its leaders and its actions ... much to the delight and encouragement of our enemies. WHAT I AM ... is an American who understands the difference between "censorship" and "choice." Evidently, these individuals do not, because when these same "celebrities" receive public ridicule for their offensive actions, the first thing they yell is "Censorship!" What they seem incapable of understanding is ... the right of free speech and dissent is shared equally by those offended ... as well as those who offend. I support and will continue to support those films and performers whom I choose to ... and refuse to support those I don't. It is my right as an American ... a right I will continue to enthusiastically exercise. Spank That Donkey has Cpl. Mason's Message to the Democrat Leadership . Boy Scouts in Virginia, and across the nation, got some good news on Wednesday. The United States Court of Appeals for the Seventh Circuit dismissed a lawsuit filed by the ACLU opposing the Department of Defense's support of the National Boy Scout Jamboree. The Court found that the plaintiffs lacked standing to sue the Department of Defense. If the ACLU lawsuit had been successful, the National Boy Scout Jamboree, held every four years at Fort A.P. Hill in Caroline County since 1981, would not have been allowed to be held at a military installation for the next scheduled Jamboree in 2010. This would have effectively meant that there would be no more Boy Scout Jamboree in Virginia. As Attorney General, Bob McDonnell directed the Commonwealth to file an amicus brief in 2006 in support of the Department of Defense and the Boy Scouts. The Attorney General was concerned about protecting a traditional understanding of religious freedom and about the possible loss of the direct and substantial impacts the Jamboree has on the Commonwealth. It is estimated that the 2005 Jamboree brought roughly $17 million into state coffers. An estimated 300,000 visitors attended the 2005 Jamboree. Speaking about the successful outcome, Attorney General McDonnell noted, "This dismissal is a victory for Virginia, and for the Boy Scouts of America. This patriotic and character building organization has made Virginia its home for the last 25 years. Our economy benefits from the event, and our young people benefit from the positive lessons taught by, and values instilled through, association with the Boy Scouts. I look forward to welcoming the Boy Scouts back to Virginia in 2010 when they will celebrate their 100th Anniversary." In the case, Winkler v. Gates (Formerly Winkler v. Rumsfeld), the ACLU alleged that the words "duty to God" in the Scout Oath make the group a religious organization, and that any government support for the group, including use of a military facility, violates the Establishment Clause of the First Amendment. The ACLU was initially successful in a federal district court in Chicago, where a judge ruled that the military's support for the Boy Scouts' Jamboree is unconstitutional. The Department of Defense appealed the case. If the ruling had stood, it would have prevented the military from offering support for the Boy Scouts' Jamboree, despite the fact that the United States military regularly provides support for many other civic organizations. Robert H. Bork, Jr., spokesperson for the Boy Scouts, noted, "Boy Scouts of America is grateful to Attorney General McDonnell for his support in this case." "Today's decision allows everyone to get back to planning the centennial Jamboree celebrating Boy Scouts' 100th birthday," said George A. Davidson, the attorney for Boy Scouts of America who argued before the Seventh Circuit last year. With this dismissal, the ACLU's challenge to this Virginia tradition has been thwarted. Virginia Boy Scouts, and all those associated with this great organization, can once again prepare for another Boy Scout Jamboree in the Commonwealth of Virginia. Terrorists use blogs against us ... "Media Jihad"